The proposal would allow for the construction of a new ten-unit, four-story residential development on a vacant Brooklyn lot. On December 12, 2016, the City Council’s Subcommittee on Zoning and Franchises heard testimony on an application for the rezoning of three lots at 14–18 Carroll Street, in the Columbia Street Waterfront District neighborhood in Brooklyn Community District 6. The developer proposed the construction a ten-unit residential building on three vacant lots, totaling 6,229 square feet and currently zoned for light manufacturing. The application included a zoning text amendment to apply Inclusionary Housing regulations to the area prior to the December 12th hearing. The developer would have had to make a required payment into the City’s affordable housing fund required by the Mandatory Inclusionary Housing law. Brooklyn Community Board 6 voted unanimously to conditionally approve the application with the requirements that the building retain the design presented to the Board, that the funds paid to the affordable housing fund be used within Brooklyn Community District 6, and that the funds paid to the affordable housing fund be proportional to the building size even if it falls below the threshold requiring a payment. Brooklyn Borough President Eric Adams also recommended approval, however suggested that the affordable housing payment be reflective of the most recent residential sales prices in the Columbia Street Waterfront District. He also recommended that the payment be applied to New Infill Homeownership Opportunities Program sites, of which several sites have been designated within close proximity of Carroll Street but still lack the appropriate funding and proper zoning to move forward. The City Planning Commission issued a report in favor of approving the application. Regarding the community board’s request for an affordable housing payment even if the building was not large enough, the Commission stated, “Efforts to negotiate the program’s applicability on a case-by-case basis would undermine the validity of the parameters established at adoption and expose the Mandatory Inclusionary Housing program to legal risk.” The report repeated HPD’s intention to abide by the Borough President’s request that the affordable housing payment reflects recent residential sales prices. The Commission noted, however, that specific uses of the affordable housing fund were outside the scope of the actions before the Commission. At the December 12th hearing, Adam Rothkrug, representative for developer from Rothkrug, Rothkrug & Spector LLP, presented the application to the Subcommittee. In his testimony, Rothkrug argued against the requirement for the developer to make a contribution to the affordable housing fund. MIH requires that all residential development, enlargements, and conversion of over 12,500 square feet or 10 units within the rezoning area comply with the MIH program. Additionally, developments of less than 25,000 square feet and fewer than 25 dwelling units have the option of paying a fee in lieu of providing affordable units directly. Rothkrug pointed out that legally the size of the project would only trigger if the developer maxed out the allowable floor area ratio for the site, but the developer has not proposed a size that would trigger the requirement. Supporting his argument, Rothkrug informed the Subcommittee that the developer was not aware of the specific payment amount until two weeks prior. HPD had informed the developer that payment would exceed $2.2 million dollars. Rothkrug likened the situation to when someone goes to a restaurant with no prices on the menu expecting to pay $200, only to find at the end of the meal a bill for $3,000. With the contribution at $2.2 million, the developer would have to pay $1,800 a square foot for the additional floor area above the MIH threshold. He called the $2.2 million a project killer. Rothkrug did express the developer’s willingness to work with the Council to come up with a fair and equitable contribution in some other fashion. Lander berated the applicants for pulling out of their affordable housing commitment after going through the community board, borough president and city planning hearings expressing an interest in contributing to affordable housing. Rothkrug argued back that the developer has been waiting four years to process the application and that HPD had not finalized any payment amount until two weeks prior. Rothkrug at one point stated that “historically rezonings were not dollar and cents projects. It’s not pay us this money and you’ll get your rezoning. Unfortunately, maybe that’s where it’s heading with the money going to a good cause.” Council Member Lander took offense to the statement and recommended that Rothkrug step back the comment or Lander would leave the hearing. Another disagreement arose over the framing of the zoning. Rothkrug argued that it was not worth the $2.2 million for the floor area ratio bonus from 2.0 to 2.2. Lander, on the other hand, argued that currently the lot is a 1.0 floor area ratio manufacturing site, so the $2.2 million could be the difference between 1.0 FAR manufacturing and 2.2 FAR residential. Chair Richards pointed out that Rothkrug was still not speaking to any public benefit for the project, which is at its core an upzoning—with or without the MIH bonus. CC: 14–18 Carroll Street, Brooklyn (LU 0531-2016, 0532-2016) (Dec. 12-14, 2016). 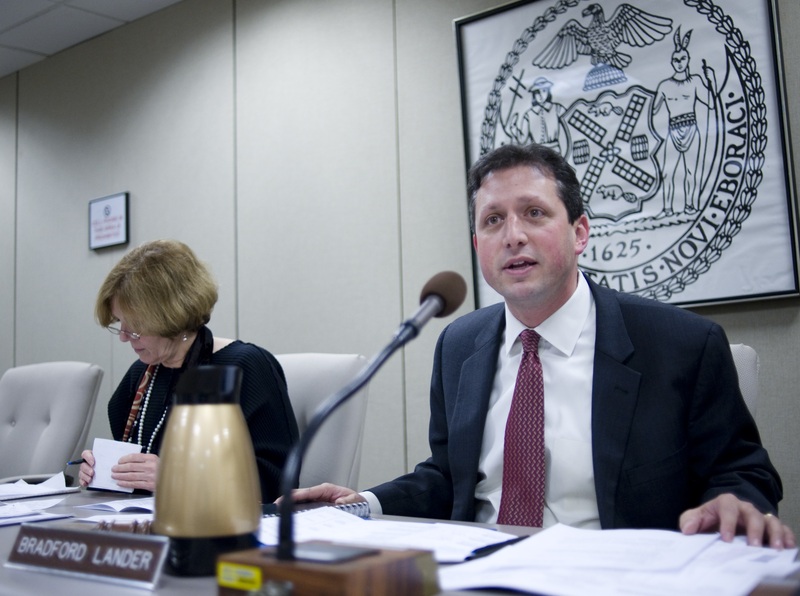 The Zoning and Franchises Subcommittee and Land Use Committee and Brad Lander for District 6 are absolutely right and stuck to their public benefit call as councilmembers for the people. BRAVO to you all! Keep up the good work! NYC needs more people like you!